Climate change activism has been uncommon in the U.S., but a growing national movement is pressing for a political response. To assess the cognitive and affective precursors of climate activism, we hypothesize and test a two-stage information-processing model based on social cognitive theory. In stage 1, expectations about climate change outcomes and perceived collective efficacy to mitigate the threat are hypothesized to influence affective issue involvement and support for societal mitigation action. In stage 2, beliefs about the effectiveness of political activism, perceived barriers to activist behaviors and opinion leadership are hypothesized to influence intended and actual activism. To test these hypotheses, we fit a structural equation model using nationally representative data. The model explains 52 percent of the variance in a latent variable representing three forms of climate change activism: contacting elected representatives; supporting organizations working on the issue; and attending climate change rallies or meetings. The results suggest that efforts to increase citizen activism should promote specific beliefs about climate change, build perceptions that political activism can be effective, and encourage interpersonal communication on the issue. The online version of this article (doi: 10.1007/s10584-014-1173-5) contains supplementary material, which is available to authorized users. A recent analysis attributes the failure of U.S. cap-and-trade legislation in 2010 to the lack of a broad-based national movement, and argues that legislation is unlikely without a large, well-orchestrated and sustained climate movement (Skocpol 2013). Citizen activism, it has been suggested, is the most efficacious method of achieving emission reductions, given that governments are unlikely to enact carbon limits without public pressure and individual conservation alone is incapable of producing sufficient emission reductions (Ockwell et al. 2009). Climate activism has been relatively infrequent in the U.S.: In 2012, 11 percent of Americans contacted an elected official in support of mitigation policies, and 16 percent supported an organization working to reduce global warming (Leiserowitz et al. 2012a). Yet the majority of Americans believe global warming is occurring and say they are worried about it (Leiserowitz et al. 2012b). The science communication community has recognized that a simple presentation of the scientific facts does not necessarily motivate public engagement, and meta-analysis has shown that science literacy is only weakly correlated with public attitudes toward controversial scientific issues such as climate change (Allum et al. 2008). Values and motivated reasoning may bias information-seeking, interpretation and response to scientific issues (Kahan et al. 2010; Kunda 1990), and communicators have been advised to convey climate information in ways that connect with audience values, increase the issue’s relevance by emphasizing local consequences, and emphasize the co-benefits of emission reductions (Maibach et al. 2008; Myers et al. 2013; Bain et al. 2012). These approaches may enhance public receptiveness to the issue, but in this paper we argue that at least some understanding of both the threat and its potential solvability do matter and are important predictors of support for climate action, even when values are taken into account. We also propose that activism is currently constrained by public beliefs that political activism is ineffective. To assess these propositions, we develop and test a two-stage information-processing model of climate activism using a nationally representative survey of American adults. Our two-stage information-processing model of climate activism is grounded in social cognitive theory (Bandura 1986, 1977), which posits that people’s behaviors are influenced by their expectations about the likelihood and desirability of the outcomes associated with actions – outcome expectations – and their perceived ability to perform those actions – efficacy perceptions. The pertinent forms of expectation and efficacy for this analysis are risk perceptions – outcomes expected in the absence of climate change mitigation; response efficacy – belief that actions to reduce a threat will be effective; self-efficacy – belief that one is capable of performing an action – and collective efficacy – belief that one’s group is capable of acting together to achieve a shared goal (Bandura 2000; Witte and Allen 2000). We propose that outcome expectations and efficacy perceptions influence people’s responses to climate change in two ways: First, people who hold negative climate change outcome expectations (high risk perceptions), and who believe in humanity’s collective potential to reduce the threat (high collective efficacy) will develop beliefs that societal mitigation action should occur and the emotional involvement necessary to motivate behavior. People will then evaluate their response options. Those who believe that legislators will be responsive to citizen activism (high response efficacy), and who feel capable of engaging in activist behaviors (high self-efficacy) will be more likely to act. Activism response and self-efficacy are hypothesized to be influenced by two factors: People with a history of civic engagement and opinion leaders – people who communicate frequently about the issue and exercise social influence on it – may have greater confidence in their ability to act effectively. Studies from diverse theoretical perspectives support our hypothesized social-cognitive model, shown in Fig. 1. Below, we connect the model to related constructs in the literature. Negative outcome expectations for the environment have been identified as a primary precursor to environmental activism in multiple studies (Stern et al. 1999; Lubell 2002; Lubell et al. 2007). On average, however, Americans have viewed climate change as only moderately harmful, and their level of perceived threat has been closely related to cultural values: For egalitarians, the threat to the health and safety of others enhances climate concern, while for individualists, the perceived threat to individual freedoms from government policies attenuates climate concern and generates doubt and disbelief about climate change itself (Leiserowitz, 2005). Low efficacy has been shown to be a significant barrier to climate action, manifesting as avoidance, helplessness and denial (Stoll-Kleeman et al. 2001; Lorenzoni et al. 2007; Ockwell et al. 2009). From a social cognitive perspective, this presents a significant barrier to positive action; fear alone, as Bandura (1986) writes, can backfire – an assertion supported by research on fear appeals using the Extended Parallel Process Model (EPPM; Witte and Allen 2000). According to the EPPM, upon perceiving a potentially threatening outcome, individuals assess its severity and their susceptibility. If either is perceived as low, threat processing stalls and no response is elicited. Conversely, as individuals’ perceptions of severity and susceptibility increase, they experience fear, which motivates an evaluation of the effectiveness and feasibility of recommended responses to reducing the threat – i.e., response efficacy and self-efficacy. When fear of a threatening outcome is high and response or self-efficacy is low, people employ coping responses that reduce their fear, but not the threat – e.g., defensive avoidance, denial, and issue/message derogation. In contrast, when efficacy is high, people adopt intentions and behaviors aimed at reducing the threat. Studies that have examined climate change outcome expectations and efficacy beliefs together have shown that both predict climate change attitudes and behaviors (Krosnick et al. 2006; Lubell 2002: Lubell et al. 2007). These studies do not explicitly situate themselves within social-cognitive theory or cite the EPPM, but each includes the key concepts discussed above, and can thus be interpreted in light of the current discussion. Issue involvement increases attention to an issue (Petty and Cacioppo 1986) and behavior change (Chaffee and Roser 1986); it is a precursor to opinion leadership (McLeod et al. 1999), political participation (Brady et al. 1995) and activism (Schwebel 2008). We hypothesize that understanding the threat of climate change and recognizing its potential for reduction will generate affective issue involvement and injunctive beliefs, i.e., beliefs that societal action should be taken to reduce the threat.2 This will motivate an evaluation of available methods to reduce the threat, moving people into a second-stage of processing. Numerous studies have examined the factors underlying political and social movement participation. Brady and colleagues (1995) identified three classes of political participation predictors: Resources, including time, money, and skills; issue engagement, including involvement and the perceived effectiveness of actions; and social proximity to activist networks. Klandermans (2004) found that people typically participate in social movements to influence society or politics; strengthen personal identity through membership in an admired group; and/or derive meaning from the movement’s ideology. For those who participate primarily to promote social change, participation hinges on beliefs that activism is effective, can succeed, and that one’s participation will increase the likelihood of success (Burstein et al. 1995; Finkel et al. 1990) – i.e., high response efficacy. In the case of climate change activism, these are likely barriers: Multiple polls report that Americans believe legislators ignore public opinion and act based on the wishes of campaign contributors (Pew 2007; Leiserowitz et al. 2013). Prior experience with political participation and civic engagement on other issues can be expected of climate activists: Exercising one’s skills is intrinsically satisfying and an important driver of the actions people choose (Bandura 1986). Civic skills and political interest are the strongest predictors of political activities requiring a commitment of time, but not money (Brady et al. 1995), and participation fosters positive outcome expectations, enhanced self-efficacy, opinion leadership and further participation (Shah and Scheufele 2006). Demographic differences in U.S. political participation may be understood as proxies for civic skills: Education is the strongest distinguishing factor; occupation, income, gender, and race are related to political participation as well, although gender differences are declining, and racial differences are explained by education and historical obstacles created to reduce minority participation (Verba et al. 1995). Opinion leadership, like civic engagement, is associated with high self- and response efficacy for political participation (Weimann 1991, Scheufele and Shah 2000). Opinion leaders’ anticipation of positive results from their own actions is not unfounded: Legislators respond more to opinion leaders than to other members of their constituencies (Adams and Ezrow 2009). Integrating the literature discussed above, we developed the two-stage information-processing model of climate activism shown in Fig. 1. In the initial phase, the individual cognitively appraises climate change, assessing its dangers and solvability, guided, in part, by cultural values. In the second phase, those who have concluded that climate change is both dangerous and solvable assess whether political activism is an effective and feasible method of reducing the danger. The initial appraisal focuses on the key beliefs identified by Krosnick and colleagues – certainty that climate change is occurring, poses a dangerous threat, is caused by humans, and may be reduced by humans. In turn, holding these beliefs is hypothesized to generate affective involvement with the issue and injunctive beliefs that action should be taken by a variety of societal actors – government, corporations and individuals. We expect that involvement, injunctive beliefs and a history of civic engagement together will predict global warming opinion leadership, as evidenced by more interpersonal communication on the issue, enjoying this communication, and giving advice. Opinion leadership should be associated with higher political self-efficacy, given the communicative competence and confidence opinion leadership reflects, as well as stronger belief in the effectiveness of political activism, i.e., higher activism response efficacy. 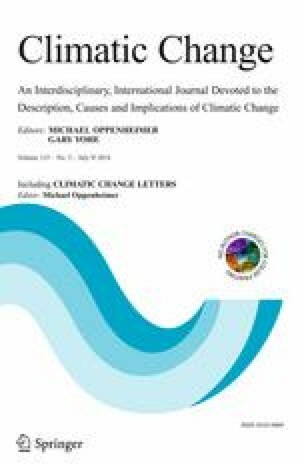 Finally, we hypothesize that climate activism – both actual and intended – is predicted by six variables: Affective involvement with the issue; injunctive beliefs that action should be taken; a history of civic engagement; global warming opinion leadership; activism response efficacy; and political self-efficacy. Data for this study were obtained from a nationally representative survey conducted in October and November, 2008; respondents were adult members of an online, non-volunteer, probability-based panel with 50,000 members. The study had a recruitment rate of 21.6 %, a profile rate of 56.4 %, a completion rate of 54.1 %, and a cumulative response rate of 6.6 %; N = 2,164. Four Likert-type measures were used to assess egalitarianism (α = .72) and four were used to assess individualism (α = .77). (1) Belief certainty regarding the reality of global warming was assessed with a nine-point scale ranging from (1) complete certainty that global warming is not occurring; to (5) don’t know; to (9) complete certainty that it is occurring. (2) Risk perception was measured with a 23-item standardized index that assessed who is threatened by climate change; what types of impacts climate change will cause; how probable several impacts of climate change are; and when climate change will begin to harm people (α = .97). (3) Belief in human causation was assessed as a dichotomy – the respondent does or does not recognize that humans are causing global warming. (4) Collective efficacy: The belief that global warming is solvable was assessed with a 5-point scale from (1) Global warming isn’t happening to (5) Humans can reduce global warming, and are going to do so successfully. Affective issue involvement was assessed by two items: Worry about global warming was assessed on a 4-point scale from “not at all worried” to “very worried”; and personal importance was assessed on a 5-point scale from “not at all important” to “extremely important” (α = .87). Injunctive beliefs were assessed with seven 5-point items asking whether a variety of societal actors should be doing more or less to reduce global warming: Local government officials; state legislators; governors; the U.S. Congress; the president (Bush); corporations and industry; and citizens themselves (α = .97). Civic engagement was assessed by asking which, if any, of 11 political activities the respondent had engaged in over the prior year, such as attending meetings, writing letters, or working for a political party (α = .72). Global warming opinion leadership was measured using five items. Respondents were asked whether they liked to discuss global warming; if other people came to them for advice on the issue; if they believed that others perceived them to be a good source of information; if they gave more information on global warming than they received in discussions; and how often they had discussed the issue over the past 2 weeks. All five items were coded bi-directionally, with positive scores indicating opinion leadership for mitigation; negative scores indicating opinion leadership against mitigation; and zero indicating no opinion leadership (α = .63). Response efficacy was assessed with three measures asking how effective respondents believed the three activism behaviors would be on 4-point scales from “no effect” to “highly effective” (α = .90). Self-efficacy was assessed indirectly as perceived barriers to climate activism because our data set did not include more direct measurements for the construct; a total of 25 barriers to the three behaviors were assessed, encompassing low skills, interest, perceived response efficacy, and identity (α = .72). The data were weighted using demographic distributions from the most recent Current Population Survey to yield nationally representative results.6 The model in Fig. 1 was tested in AMOS 19.0 using unweighted data7 and only those respondents who believe climate change is occurring because those who do not believe it’s occurring are unlikely climate activists. We assessed the roles of the constructs in the model several ways: A confirmatory factor analysis of the measurement model tested the adequacy of the measures for each construct, and a one-factor model assessed whether all indicators in the model could be treated as components of a single factor. Reduced models were assessed, comparing the amount of variance in activism explained by demographics, values and key beliefs.8 Finally, the full model was fitted to the data, indicating the degree to which the mediators and second-stage processing variables explain additional variance in activism, beyond values and key beliefs. Of the 2,164 respondents, 16.9 percent (N = 365) had engaged in one or more of the three political activism behaviors at least once over the prior year (Table 1). Comparing respondents who had engaged in any form of activism to those who had not, we found that activists had more education (t = 8.34***)9 and higher incomes (t = 3.44***); 57 percent of the activists were female, compared to 51 percent of the non-activists ( Χ 2 = 5.24*). Activists had significantly higher means than non-activists on all key belief measures; the key beliefs in combination were related to much higher levels of climate activism (Table 2). Activists had significantly higher means on all mediators and second-stage variables as well: They were more emotionally engaged with the issue, wished to see more action to address the issue; had higher opinion leadership, civic engagement, and climate activism response efficacy; and they perceived fewer barriers (Table 3). Respondents who did not believe global warming is happening were dropped from the analysis, leaving N = 1,706 for the modeling. The omnibus confirmatory factor analysis model contained all indicators of the latent constructs, omitting the observed variables (Χ 2 = 3124.78 (df = 329)***; Χ 2 /df =9.50; RMSEA = .071; CFI = .905). Modification indices suggested the fit could be improved by freeing four correlated error terms,10 and when these were freed, the data were found to be consistent with the model (Χ 2 = 1473.32 (df = 325)***; Χ 2 /df =4.53; RMSEA = .046; CFI = .971). See Supplemental Materials for detail on this and all subsequent models. We fitted three models initially: In the first, values and demographics predicted activism; in the second, key beliefs and demographics were the predictors; and in the third, values, key beliefs and demographics were all included. Seventeen percent of the variance in climate activism was explained by values (egalitarianism β = .23***; individualism β = -.11**); and demographics (education β = .21***; age β = .08**; income β = .06**). Twenty-one percent was explained by three key beliefs (belief certainty β = .12***; risk perceptions β = .29***; collective efficacy β = .08**); and education (β = .11***). The model containing values, key beliefs and demographics explained 24 percent of the variance in activism: (egalitarianism β = .11***; certainty β = .10***; risk perceptions β = .24***; collective efficacy β = .06*; education β = .19***; income β = .06*; age β = .06*). Thus, the key beliefs were stronger predictors of activism than values, and the addition of values to key beliefs as activism predictors added only an additional 3 percent of explained variance. The initial test of the full structural model included the measurement model, theory-specified structural paths, and the demographic controls (Χ 2 = 3184.45 (df = 631)***; Χ 2 /df =5.05; RMSEA = .049; CFI = .926). The initial fit of the data to the model suggested several improvements, which were implemented to develop Fig. 2; this model explained 52 percent of the variance in climate activism, and was judged a good fit to the data (Χ 2 = 2278.75 (df = 526)***; Χ 2 /df =4.33; RMSEA = .044; CFI = .948). Non-significant paths were dropped from involvement to activism and from injunctive beliefs to opinion leadership. The modification indices indicated a direct influence of certainty that global warming is occurring on opinion leadership, which has been added. All four key beliefs were significant predictors of issue involvement and injunctive beliefs, with risk perceptions having the strongest impact. Together, they explained 39 percent of the variance in injunctive beliefs and 68 percent of the variance in affective involvement. Involvement and a history of civic engagement together explained 44 percent of the variance in opinion leadership, which in turn explained 22 percent of the variance in activism response efficacy. Opinion leadership explained only 4 percent of the variance in self-efficacy. Finally, 52 percent of the variance in climate activism was explained by six variables: Opinion leadership, civic engagement, activism response efficacy, injunctive beliefs, perceived barriers and gender. In summary, the key beliefs and demographics explained 24 percent of the variance in activism, and the second-stage variables added an additional 28 percent of explained variance. Examples of a growing U.S. climate movement are numerous: Protests against the Keystone XL pipeline drew an estimated 40,000 people to the National Mall in Feb. 2013, and a million comments were submitted to the State Department opposing the pipeline by late April; a national anti-coal campaign has shut down hundreds of existing and proposed coal-fired power plants; over 10,000 congregations have come together under the umbrella of Interfaith Power and Light to activate faith communities; and a growing student and popular movement is pressuring universities, faith communities and cities to divest from fossil fuels. The Congress, however, remains deadlocked on the issue, with climate skeptics blocking action. In light of research arguing that a legislative response to climate change is unlikely without increased levels of civic activism, we have examined some of the cognitive processes that motivate people to become involved; below, we explore the implications. The key beliefs – that climate change is real, human caused, dangerous, and solvable – have been emphasized, to differing degrees, by communicators for some time. This analysis confirms that these are important messages; the emphasis, however, has often been on the first three beliefs, with less attention given to solvability. Surveys show that risk perceptions have increased over the past 5 years in the U.S. – although still not necessarily achieving a level that accurately reflects the magnitude of the risk -- while beliefs that individual action can make a difference have declined (Leiserowitz et al. 2012b). Collective efficacy is also low: A fifth (22 %) of our respondents believed that society could reduce global warming, but won’t because people are unwilling to change their behavior. Half said it’s unclear what society will do, while only six percent said society can and will. Communicators face a public in which some are frightened and despairing, while others do not recognize there is cause for concern: Addressing the latter with messages about climate impacts runs the risk of increasing despair in the former, unless messages are accompanied by credible, achievable solutions. A clear implication is that climate communicators should work to build a sense of efficacy among their audiences. One possible strategy is to present efficacy-building information first, followed by information on the threat. The Science Museum of Minnesota’s climate change exhibit, for example, begins with efficacy-building and then turns to climate impacts. Their surveys show that climate change beliefs among museum visitors mirror national benchmarks, but a 2011 evaluation of the exhibit found that 60 percent of the visitors felt hopeful after seeing the presentation (Phipps and King 2011), as compared to 47 percent of Americans nationally (Leiserowitz et al. 2010). This was not a formal test of efficacy-building, but it suggests that a larger-scale assessment of this idea would be useful. Global warming opinion leadership – defined in terms of interpersonal discussion and self-perceived interpersonal influence – was the strongest direct predictor of climate activism, mediating the influence of involvement on activism. Studies have long shown that people are more influenced by those they know than any other source: Only climate scientists are more trusted on global warming than interpersonal contacts (82 % vs. 77 %, respectively; Leiserowitz et al. 2009). Building opinion leadership on the issue – e.g., by encouraging those who are concerned about the issue to discuss it with their friends and family, and eventually with other more socially distal people – may be one of the most effective methods of building public engagement and political activism: Network analyses have shown that interpersonal influence in arenas as diverse as obesity, happiness and cooperation extends as far as 1,000 people and three-degrees of separation (Fowler and Christakis 2010). Simply understanding this fact can build the opinion leader’s sense of the significance and effectiveness of personal action. Of the barriers to activism we assessed, identity was the largest, with a third of respondents (33 %) saying they were not activists. Studies of social movements show that an important motivation for participation is the strengthening of identity (Klandermans 2004), and one strategy for building a broad-based climate campaign could be to employ spokespeople a wide range of people can or would like to identify with e.g., activist mothers, doctors, celebrities, high school students, etc. Relatively few respondents viewed any form of activism as effective: Donations were viewed as “highly” or “pretty” effective by 22 percent of the respondents; contacting government officials by 15 percent; and attending rallies by 12 percent. Almost three-quarters (74 %) said none of the three forms of activism would have much effect; altering these perceptions should be an important objective for climate communicators. Email and social media postings touting movement success are commonly used by environmental organizations for this purpose, and evaluations of their effectiveness would be useful. These data are cross-sectional, so the causal pathways we postulate oversimplify relationships. A longitudinal study would likely identify feedbacks among the variables in the model, with political activism strengthening issue involvement, opinion leadership and injunctive beliefs, and decreasing perceived barriers, for example; opinion leadership and civic engagement effects are likely to be bi-directional as well. This is consistent with Bandura’s concept of reciprocal causation, as well as numerous studies demonstrating bi-directional effects over time. Our model, however, focuses on the factors leading people to become climate activists, rather than increasing activism among those who are already engaged, so feedbacks are less relevant to our purpose. A second caveat is that the model addresses only mitigation – not adaptation. The role of human causation and collective efficacy for reducing climate change are unlikely to play such important roles in support for adaptation; a substantial portion of the public still believes that climate change is being caused by natural changes in the environment, and these individuals may support action to adapt to climate change, even as they oppose policies to mitigate it. Together, the analyses suggest that those working to build a broad, sustained climate movement should continue to emphasize the key beliefs identified in this study, as well as the widespread agreement among scientists on these issues, a perception shown to significantly increase all four beliefs (Ding et al. 2011). The threat posed by climate change should continue to be a component of climate change messaging, but should be accompanied – and perhaps even preceded – by messages on effective actions individuals can take. This alone is insufficient, however: The results suggest that supporting public beliefs about the effectiveness and feasibility of activism is also central. Americans perceive multiple barriers to political participation, and have low expectations for the effectiveness of their actions. Campaigns should encourage interpersonal discussion of the issue to build affective involvement and opinion leadership, and to spread the influence of those who are already engaged with the issue to their social networks. Our own collective efficacy will…shape how future generations live their lives. Considering the pressing worldwide problems that loom ahead, people can ill-afford to trade efficacious endeavor for public apathy or mutual immobilization. The times call for a commitment of collective effort rather than litanies about powerlessness that instill in people beliefs of inefficacy to influence conditions that shape their lives (1986, p. 453). Recognition of human causation forms the basis for collective response efficacy: If humans were not causing climate change and recent changes in the climate were being caused by natural environmental cycles, then human ability to reduce climate change would be doubtful. Our measures and conceptualization of injunctive beliefs are similar to the personal normative beliefs contained in the VBN model (Stern et al. 1999). The VBN construct focuses on beliefs about what should be done by society and by the respondent personally. Our construct is similar, but does not include the personal dimension of the construct, focusing instead on respondents’ desired response from government, corporations and citizens. The collective focus of our measures reflects the importance of collective action on climate change. We have renamed the construct “injunctive beliefs,” given the strong focus on what should occur. Methods and measurement are summarized very briefly here; details are available in Supplementary Materials. Almost all respondents who intend to act less frequently have not acted previously (97 %); this does not make logical sense, but was the pattern in the data. Cronbach’s α assesses the reliability of an index and ranges from 0 to 1. A rule-of-thumb for acceptable levels of alpha is .6 or higher. Data were weighted by gender; age; race/Hispanic ethnicity; education; census region; metropolitan area; and internet access. AMOS is unable to work with weighted data. We will compare the variance explained by the various reduced models, but not the fit, as fit comparisons can only be made between models containing the same variables, but different paths. For all statistical tests, *p < .05; **p < .01; ***p < .001. The correlated errors have substantive meaning and are not simply statistical artifacts: Correlated errors of the injunctive belief measures linked higher desire for action from President Bush & the U.S. Congress; state legislators and local government; and corporations and citizens. Two opinion leadership measures were also linked: Being a source of advice and being perceived as a good source. Education significantly predicted civic engagement, but was not directly related to activism; hence, it was dropped. This finding must be interpreted cautiously, however, in light of the small number of respondents in the high risk, low efficacy group (n = 31). The authors wish to thank the two anonymous reviewers for their comments, which were very helpful.